I am trying to create a groove in a roll that I am modeling and I am having issues where the groove is so small that the helical sweep wouldn't regenerate. So, I changed the accuracy of the part to absolute and .0001. The helical sweep will now regenerate, but it takes forever and I can't get the drawing for the assembly this part is in to open. Any suggestions? Model the sweep for a small portion of the cylinder and make a note that it should extend the length, then create a detailed view of the that end of the cylinder showing the details of the groove. Fake the helical part. Just model it as a revolved cut. Should be much faster to regenerate. Then create the detailed view. Model the sweep as surfaces and then use them to make a solid cut. Should also regenerate faster. Still go with a high magnification detailed view to display the details of the groove. I would not suggest trying to sketch it in the drawing, that is just asking for trouble. Yeah, don't model the sweep. Instead just create a sketch the shows the sweep profile and show this sketch on the drawing in a detail view. 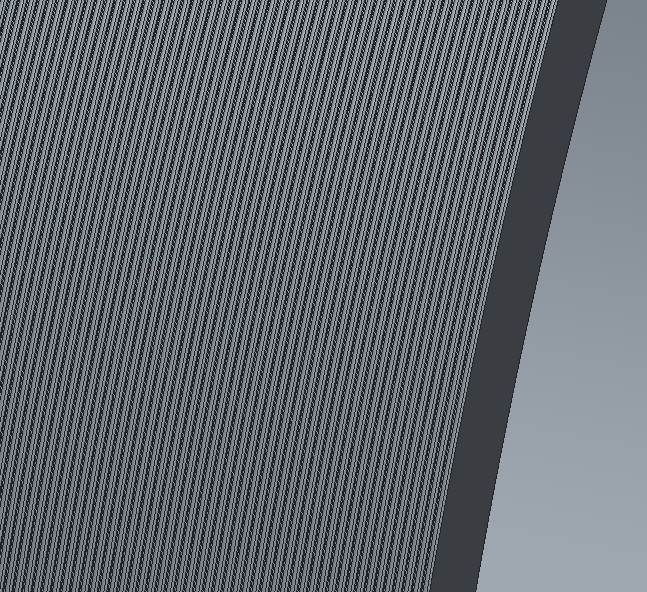 The problem is that the profile of the groove is so small that its not showing up in the drawing after I sketch it in the model. I might just have to sketch it in the drawing for it to work correctly. With a detailed view you can set the scale completely different from the other views and really "zoom in". Thanks Marc, that worked well with faking the part with a revolved cut.